We've put together a list of photos with our pad sizes and styles, plus added a description of each size and the prices. 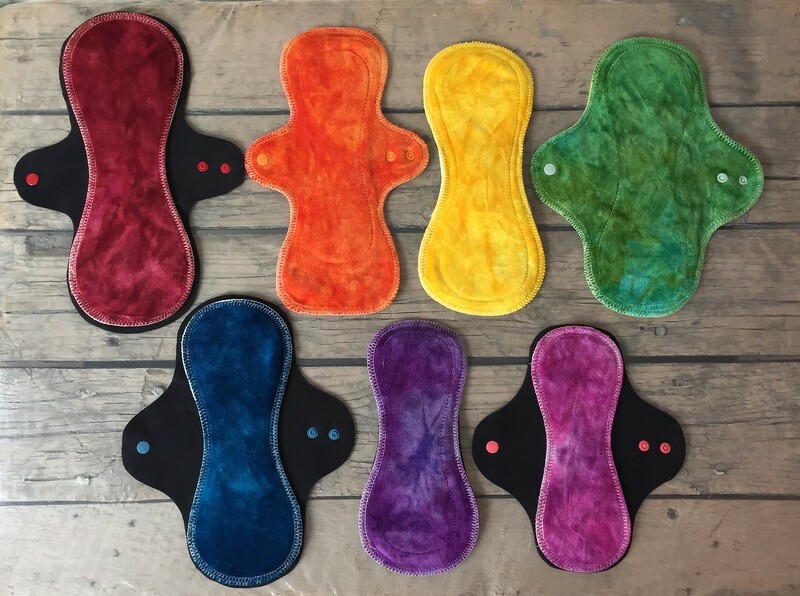 These prices are for hand dyed bamboo velour topped pads, with high quality, water resistant backing. Prices vary for our other fabrics, for example our undyed pads, and flannel pads are 1.00 less per larger pad, 50 cents less per small pads. Specialty dyed fabrics, such as our swirl dyed fabrics, are 1.00 more per pad. Pads with zorb are an additional 1.50 per pad. Each of these liners and light pads are perfect for light flow protection. 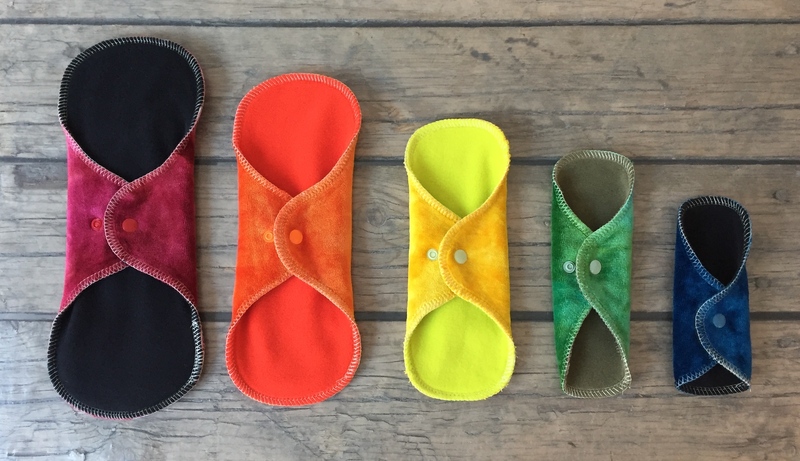 If you're in need of a back up for a menstrual cup or tampons, or in need of light bladder protection, these are the go to pads. 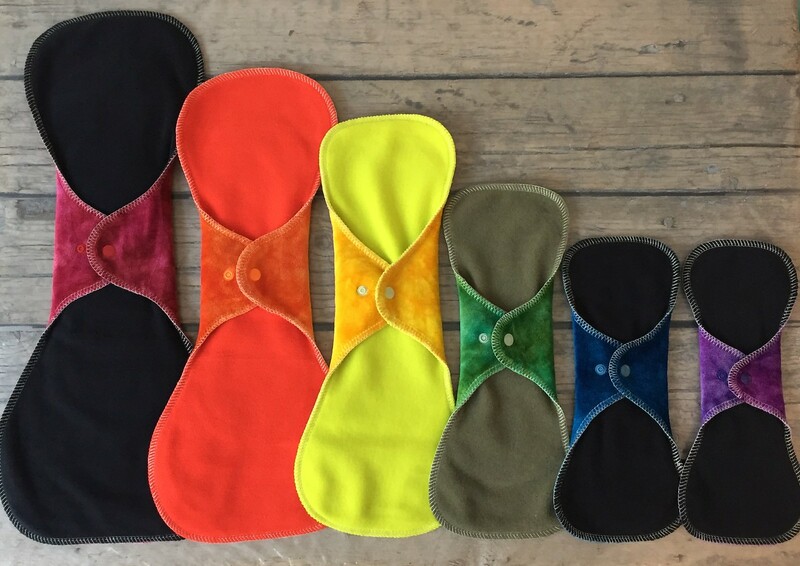 All, except for the PantyWrap and HalfWrap, have an additional inner layer, which provides for just a bit more protection than the PantyWrap and HalfWrap which are simply the top absorbent layer plus the water resistant backing. All these are available with a waterproof backing too. Click image to view back of pads. 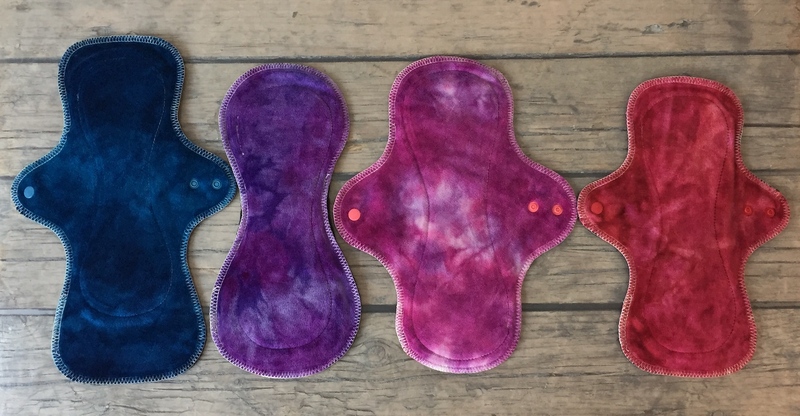 These are our 7 regular flow sizes of pads. 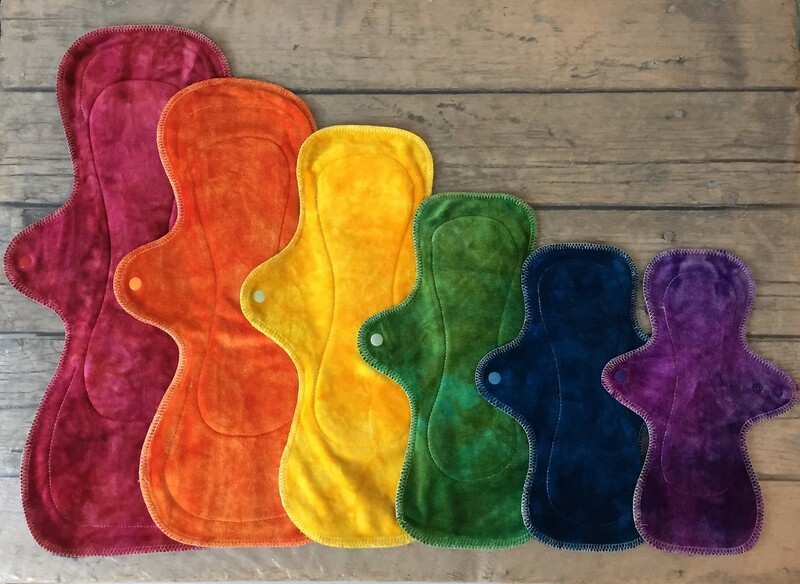 Each of these pads has an absorbent top layer (bamboo velour on these pads) and two absorbent inner layers, providing great protection for regular flow. All these can also be created with an additional layer of ZORB for a small additional cost. Adding ZORB allows these to become heavy flow pads, and zorb is also great for anyone with a fast and 'gushy' flow. ZORB is a fabric that absorbs quickly, and very well. 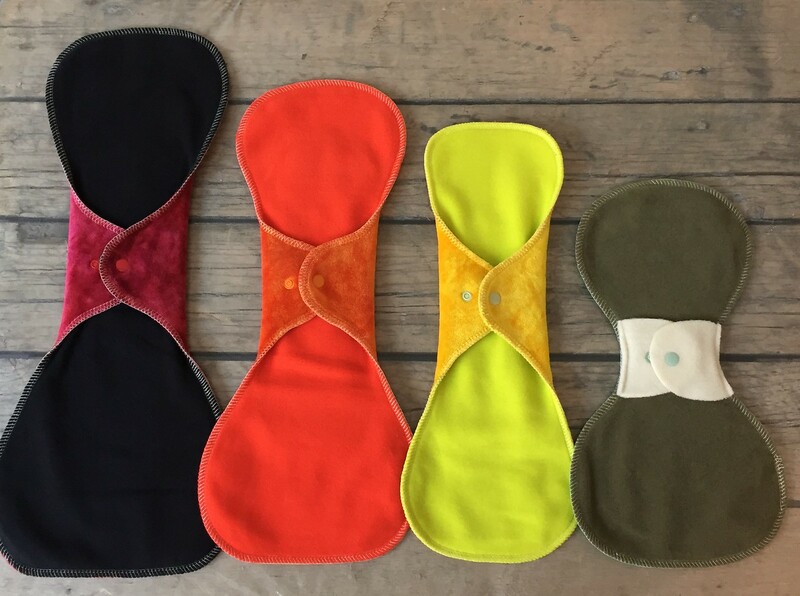 We pair it up with bamboo/cotton because we feel the combination of these fabrics together allows for the very best absorbency overall! 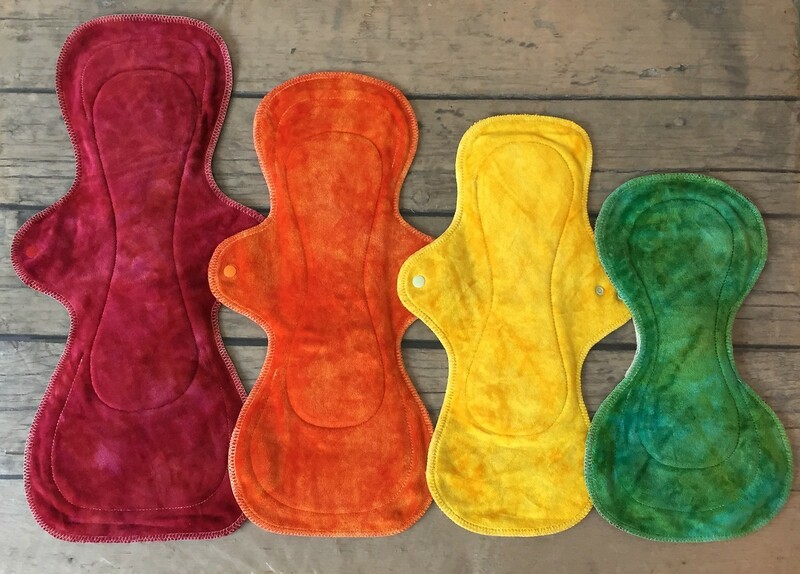 Here at Homestead Emporium we offer EIGHT different heavy flow pad options! 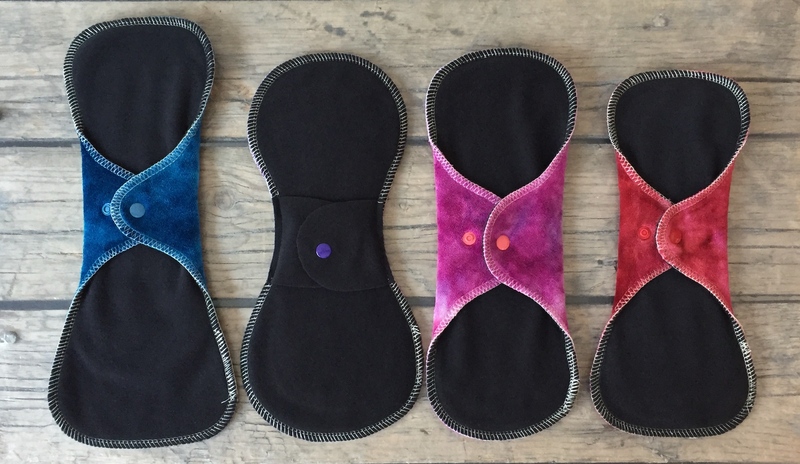 Each of our heavy flow pads has an absorbent top layer (bamboo velour on these pads) and 3-4 absorbent inner layers, providing great protection for heavy flow! 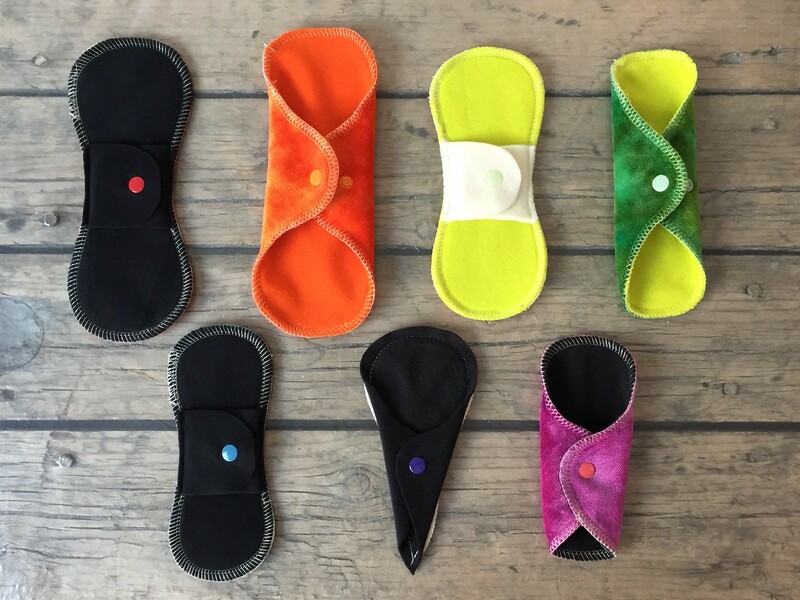 Each pad has the most layers of absorbency where it is needed most, throughout the full center of the pad, while still providing excellent absorbency everywhere else for any over flow that tends to not 'behave' and wanders away from the center. Our contour inner design layers create a pad that contours comfortably to your body, while our trimmer front and back edges allow for full protection without the feeling of a thick bulky pad. All these can also be created with an additional layer of ZORB for a small additional cost. Adding ZORB allows these to become an even more absorbent heavy flow pad. Perfect for those with a super fast 'gushy' flow. ZORB is a fabric that absorbs quickly, and very well. We pair it up with bamboo/cotton because we feel the combination of these fabrics together allows for the very best absorbency overall! The very first Homestead Emporium Ultimate pad was created 14 years ago, and was called the Ultimate Pad. Since then we've created FIVE more sizes with the same wonderful curvy contoured fit that offers the ultimate in comfort, and coverage! Without bulk! The Ultimate Pad became the UltiMax pad and the line of pads, and names, has extended from that first pad. 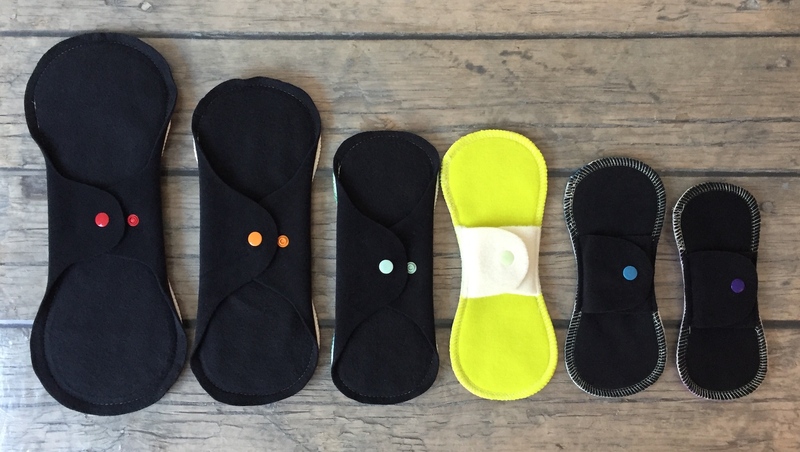 All the Ultimate pads are heavy flow absorbency except for the last on the right, which is a regular flow absorbency, the UltiMini xs. Each of these pads offers wider coverage, especially created for those whose flow tends to wander to the sides. 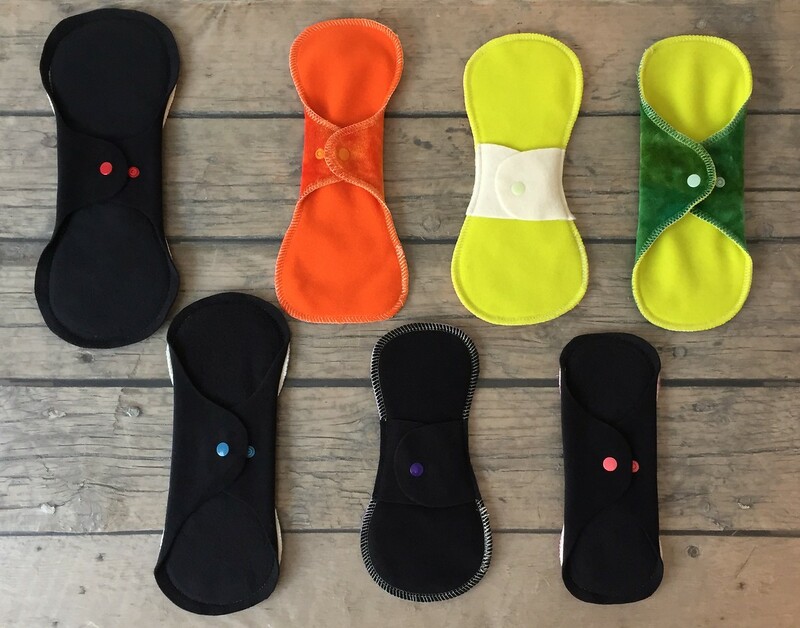 Each one has two snap settings, except for the HalfWrap pad/liner which was specifically created to be a 'wedgie free' liner for wider width undies. For narrower undies, the PantyWrap with it's two snap settings is often the favourite. 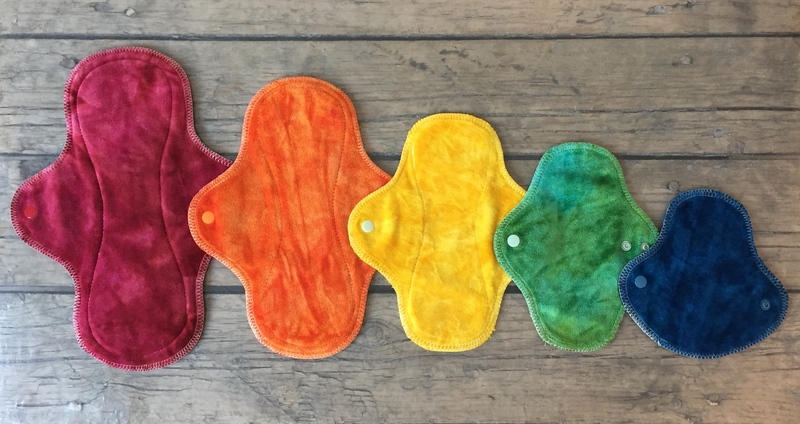 If you are new to cloth pads and not sure where to start, if you typically purchase disposable pads with wings, these would be the best option to try first. I usually suggest trying the Heavy Wrap Wing pad, the Regular Wrap Wing pad and one of the three light sizes to start with. Best suited for those who prefer a slimmer pad and are not in need of absorbency in the side wing areas. 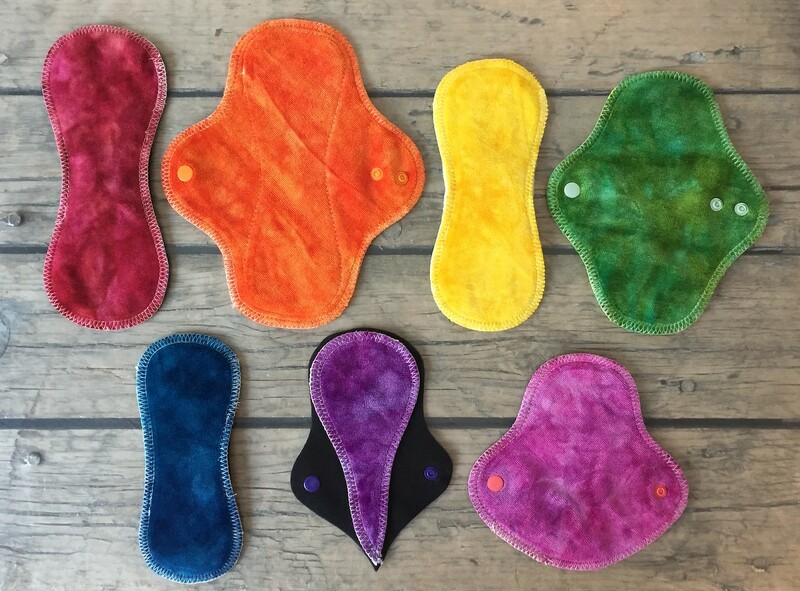 If you are new to cloth pads and typically purchase disposable pads without wings, these are a great pad to try first. I usually suggest trying out the Regular Comfort Contour and one of the light flow/liner sizes to start. Please remember that if you have any questions at all about which sizes, styles, absorbency, etc. is right for you, don't hesitate to contact us. We're here to help you find what will work best for you! The same absorbency as our regular flow pads in a longer length. The MegaMax is our newest pad. Has the absorbency of our very popular UltiMax pad in an even larger size. The shape of the UltiMax is slightly more tapered then the Ultimate Pad and the wings are fuller for even better coverage.